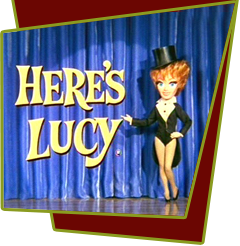 Harry takes Lucy to a Ginger Rogers Film Festival, where coincidentally Ms. Rogers is in the audience in disguise. Ginger gets so incensed at comments made about her screen acting by Lucy, who does not realize who she is, that she leaves in a huff, forgetting her purse. When Lucy opens the purse and realizes who the real owner is, she arranges for Rogers to pick it up at her house. After a squabble about who will deliver the purse to Rogers, Harry and Lucy accidently rip the purse's handle and now have to repair it before Rogers comes to pick it up. Special Notes: This episode is filmed without an audience due to a technical strike, and used a canned laugh track replacing the audience, which is a bit heavy on the laughter. The episode was filmed after only two days rehearsal as Lucille wanted to be sure it was completed in time before the strike.